The E4G has a 4.7 inch display with a resolution of 960 x 540 and a pixel density of 234 ppi. The display has the same high spec technology as Sony uses in their TVs to create a bright display perfect for watching videos or for gaming. With IPS technology the E4G has great viewing angles with sharp and accurate colours. 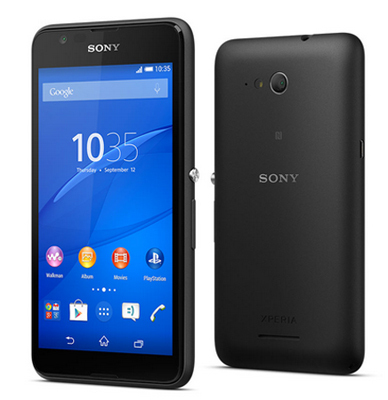 With a 1.5GHz quad core processor, backed up by 1GB of RAM, and built in LTE/4G modem, the Xperia E4G enables fast internet connections with up to 150 Mbit/s download and 50 Mbit/s upload speed. The 2300mAh battery will last up to two days, even longer if Battery Stamina Mode is in play shutting down power hungry functions. The E4G has 8GB of storage, which is expandable up to 32GB via microSD, Bluetooth 4.1 and NFC for pairing wirelessly with other devices. Sony's E4G has a 5 megapixel rear camera that is capable of shooting 1080p HD video. There is also a 2 megapixel front camera for video calling. The device features HDR and auto scene recognition to produce vivid images whether taken in daylight or in low light conditions. The Sony Xperia E4G measures 5.24 x 2.80 x 0.43 inches and weighs 4.76 ounces. With its slim design and solid sandblasted back the lightweight E4G has a good grip and with its curved edges fits well in the hand. Available in black or white, the device has Sony’s iconic aluminium power button with diamond cut edge, giving the device a premium look.